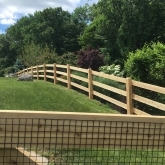 Roots Landscaping offers a multitude of masonry, fencing and landscaping services to Newtown homeowner and business owners. Our contractors strive to provide professional, high-quality landscaping services. From maintenance, to new installations and repairs, we are equipped to help improve and upgrade your landscape in Newtown. We provide professional lawn care and maintenance services to homeowners and businesses in Newtown, Ct. We offer mowing, weed control, mulching, tree planting and trimming and much more to manage the upkeep of your landscape. Roots Landscaping will work with you to design a weekly or bi-weekly schedule to ensure your property is carefully cared for. From the start of spring, mid-summer or fall preparation, we are Newtown’s choice for lawn mowing and landscape maintenance service. Mulching is often done for aesthetic reasons, but also provides nutrients to your plants by locking in sunlight and moisture. We can help you choose the right mulch for your property and plants to ensure your shrubs, trees and flowers are best taken care for. We can help you water and grow your garden so you can spend more time enjoying your Newtown landscape. Roots Landscaping offers pruning and care services for trees, shrubs and plants to Newtown homeowners and business owners. We can help make the entrance of your office beautiful and welcoming, while making a nice oasis for your home. Let our professional contractors take care of your pruning needs to help sustain and promote the growth of your plants. We offer spring, fall and storm clean ups to Newtown residents. Fall preparations are great to make sure your plants are all wrapped up and secure for the upcoming winter. In addition, we’ll rake up leaves, dead plants and take care of other branches or trees in the Fall. When it comes to spring, we’re here to help with shrubbery, pruning and lawn maintenance. If there is every a storm, we can help you cleanup your property and make sure it is back to normal. We’ll pick up branches, small fallen trees, rake up debris and more! 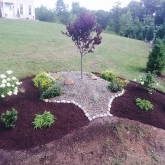 At Roots Landscaping, we offer custom landscape designs for your Newtown property. Our process begins with a full consultation in order to determine your vision and create a plan. We can help you decide what plants are best from perennials, annuals, shrubs and trees and the best location to plant them. In addition, we can curate carefully designed masonry projects to uplift your home or business. 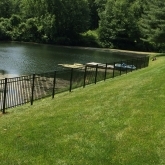 We also provide custom designed landscapes for commercial real-estate owners in Newtown, CT. We can help you craft a new pond, water feature, stone wall and much more. Our contractors are here to help you make the best decision when it comes to designing your landscape. At Roots Landscaping, we are equipped to handle a multitude of challenges, providing homeowners and business owners with creative landscape pieces. 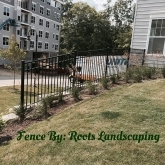 At Roots Landscaping, we provide professional, quality masonry, fencing and landscape work to improve the design of your facility or office. The appearance of your office represents your business, and we want to help put on a good presentation for you. Our contractors will have a full consultation with you to determine exactly what your Newtown business needs. After coming up with a full design, we will be sure to answer any questions and make sure you are informed of the exact procedure of our landscape services. Let Roots Landscaping help your business in Newtown, CT. Roots Landscaping is an accredited business by the BBB standards. We provide exceptional masonry, fencing and landscaping services to Newtown homeowners and business owners. To learn more about how our company can assist you, contact Roots Landscaping today. You may also call us today at 203-304-7326.